Sometimes life seems overwhelming, something we have done a million times easily suddenly seems too hard. Stress engulfs us and our focus narrows so all we can focus on are the negatives. At such times many people pray for guidance, which if it works for you is great, I meditate. PRAYING is TALKING to God or the higher connection you have and at such stress filled times can be more a case of talking AT that higher power. On the other hand MEDITATION is LISTENING. If my mind is racing I will focus on an object, it can be a tree, a flower, a picture, crystal or in my case, if possible, a candle. I then just sit, any thoughts that come into my mind I label “thinking” and go back to giving my full attention to what I am focusing on. This simple technique takes a little practise but is really effective once mastered. It stops all the noise ,gets rid of the clutter and allows space for a wider perspective to come in. My candle always brings me peace and a soft loving connection to those in spirit who support me. I hope you have a way of dealing with such hectic times, if not find something connected to your heart and try this one. You can use it anywhere, at work,on a bus or train, but obviously not while driving, all you need is that picture of your special something in your head and your set to go. I hope you are having a stress free time at present and won’t need to use this for a very long time. Blessings to you. 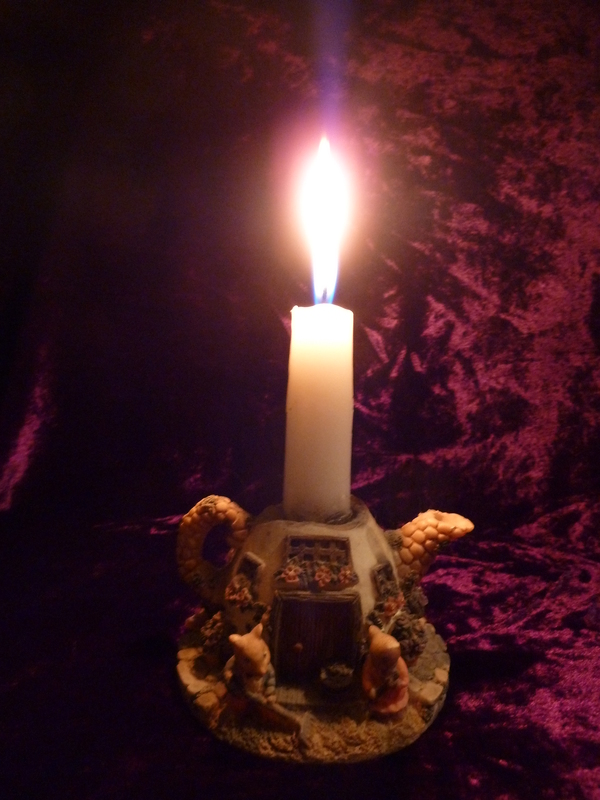 This is a picture of the ” Mouse House” candle, given to us by our dear friend Dorothy. Just looking at it, even without lighting the candle, I go instantly to a loving place of peace.